Doug Short, in his blog post of December 27, titled “The Philly Fed Business Conditions Index” displays both the CFNAI MA-3 (3 month Moving Average) and ADS Index (91-Day Moving Average) from a couple of perspectives. 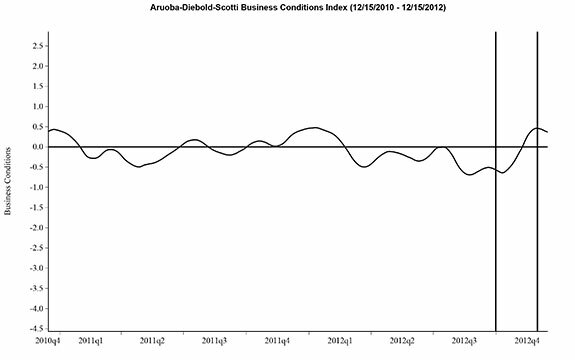 This entry was posted in Uncategorized and tagged economic indicators on December 29, 2012 by Ted Kavadas. Below are three long-term charts, from Doug Short’s blog post of December 28 titled “ECRI Update: Flunking Recession 101.” These charts are on a weekly basis through the December 28 release, indicating data through December 21, 2012. 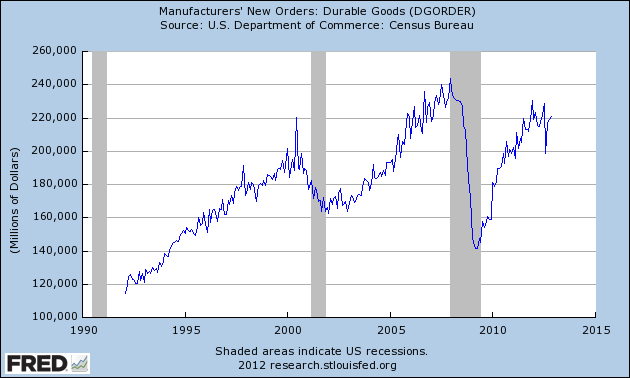 This entry was posted in Economic Forecasts and tagged ECRI on December 28, 2012 by Ted Kavadas. This entry was posted in Economic Forecasts and tagged Economic Forecasts, economic indicators, STLFSI on December 28, 2012 by Ted Kavadas. This entry was posted in Uncategorized and tagged Consumer Confidence on December 28, 2012 by Ted Kavadas. This entry was posted in Real Estate and tagged Real Estate, residential real estate on December 27, 2012 by Ted Kavadas. 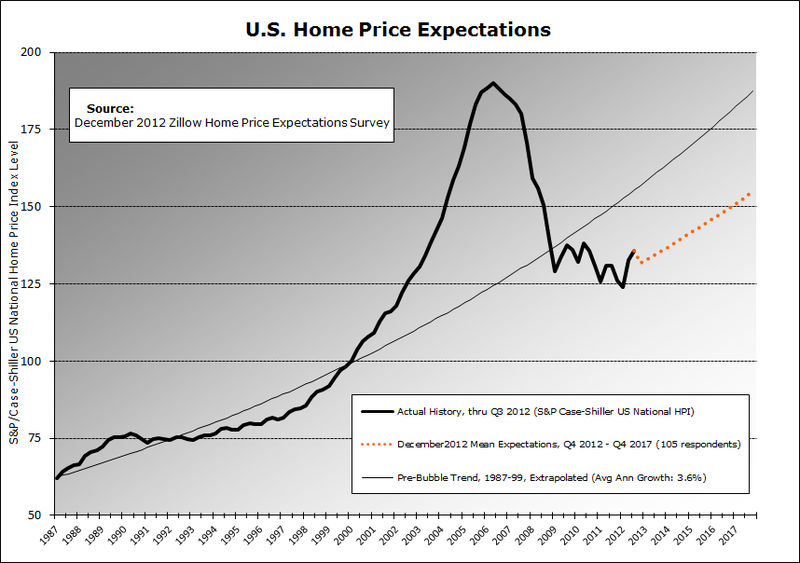 On December 26, the Zillow December 2012 Home Price Expectations Survey (pdf) results were released. This survey is done on a quarterly basis. 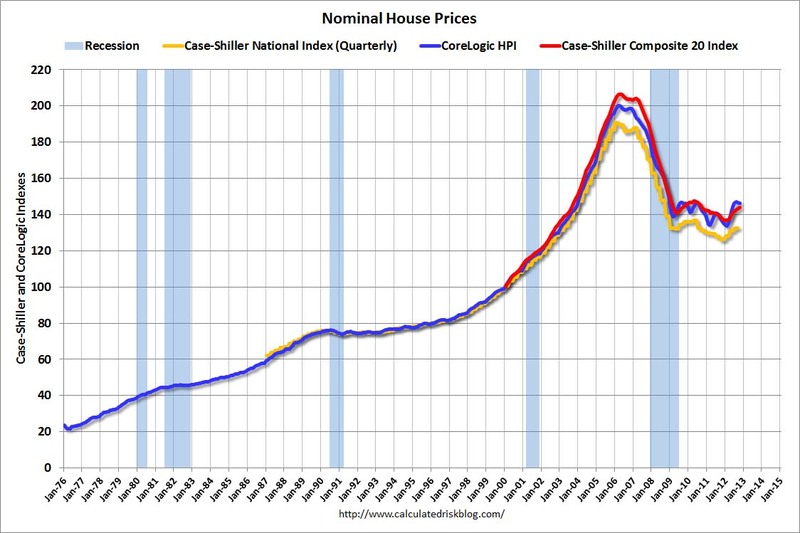 As one can see from the above chart, the average expectation is that the residential real estate market, as depicted by the Case-Shiller US National Home Price Index (NSA), will continually climb after 2012. The detail of the December 2012 Home Price Expectations Survey (pdf) is interesting. Of the 105 survey respondents, 4 (of the displayed responses) forecast a cumulative price decrease through 2017; and of those 4, only 2, William Hummer and Gary Shilling, foresee a double-digit percentage cumulative price drop, at 13.13% and 11.87%, respectively. The Median Cumulative Home Price Appreciation for years 2012-2017 is seen as 4.60%, 8.12%, 11.94%, 15.86%, 19.42%, and 23.67%, respectively. For a variety of reasons, I continue to believe that even the most “bearish” of these forecasts (as seen in William Hummer’s above-referenced forecast) will prove too optimistic in hindsight. Although a 13.13% cumulative decline is substantial, from a longer-term historical perspective such a decline is rather tame in light of the wild excesses that occurred over the “bubble” years. This entry was posted in Real Estate and tagged Real Estate, real estate bubble, residential real estate, Zillow Home Price Expectations Survey on December 27, 2012 by Ted Kavadas. On December 12 the December Duke/CFO Magazine Global Business Outlook Survey (pdf) was released. It contains a variety of statistics regarding how CFOs view business and economic conditions. The fiscal cliff is among the greatest concerns affecting the corporate sector, trailing only weak consumer demand among external concerns. Worries about governmental policies, intense price pressure and the federal budget deficit round out top external concerns of CFOs. The difficulty in maintaining profit margins is the top concern of internal U.S. firms. Other worries include the cost of health care, attracting and retaining skilled workers, and employee morale. It should be interesting to see how well the CFOs predict business and economic conditions going forward. I discussed various aspects of this, and the importance of these predictions, in the July 9 2010 post titled “The Business Environment”. This entry was posted in Business, Economic Forecasts and tagged Business, CFO and CEO Confidence, Economic Forecasts on December 27, 2012 by Ted Kavadas. 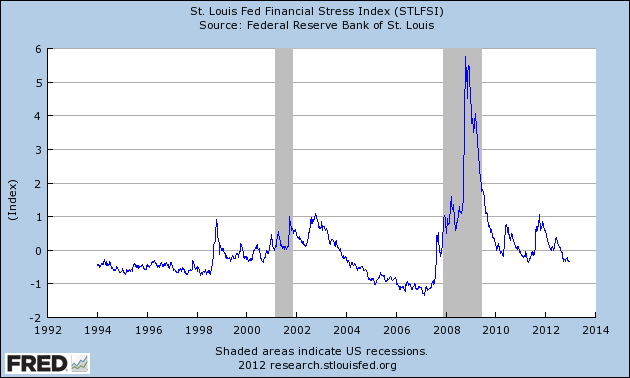 This entry was posted in Uncategorized and tagged economic indicators on December 22, 2012 by Ted Kavadas. As of 12/21/12 (incorporating data through 12/14/12) the WLI was at 127.2 and the WLI, Gr. was at 4.6%. 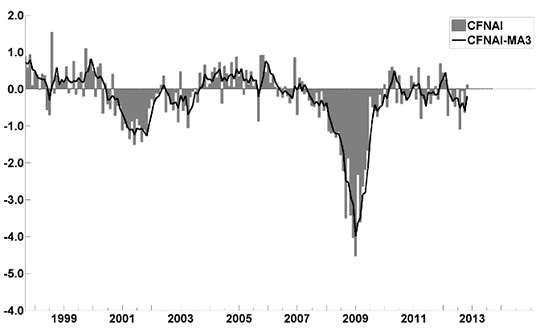 As per the December 20 press release, the LEI was at 95.8 and the CEI was at 104.9 in November. This entry was posted in Economic Forecasts and tagged ADS Index, Aruoba-Diebold-Scotti Business Conditions Index, Chicago Fed National Activity Index, Conference Board CEI, Conference Board LEI, economic forecasting, economic indicators, ECRI on December 22, 2012 by Ted Kavadas. Below are three long-term charts, from Doug Short’s blog post of December 21 titled “ECRI Update: The Recession Call Is Further Undermined.” These charts are on a weekly basis through the December 21 release, indicating data through December 14, 2012. 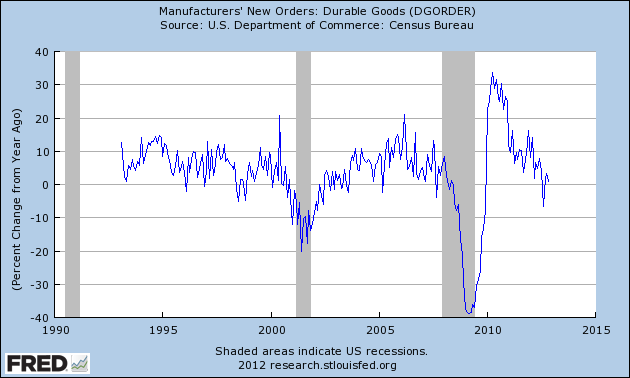 This entry was posted in Economic Forecasts and tagged ECRI on December 21, 2012 by Ted Kavadas.